Rebirth. Light. New cycle. New direction. New life...and a Snow White "goddess" pin. 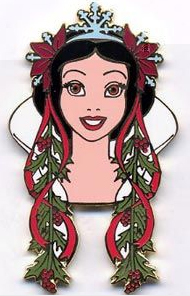 Her hair adorned with holly, poinsettia and a snowflake tiara, the lovely woodland princess Snow White symbolizes winter on this gold-finished character pin, one in a series celebrating the change of seasons with our favorite Disney princesses. It's a Disney Auctions exclusive in a limited edition of 250 fixed-price pins, available only from Disney's Purchase It Now Store at DisneyAuctions.com. Measures approximately 2.25" x 1.25"
The eve of the winter solstice, the Northern Hemisphere's shortest day of the year. Though it marks the onset of winter, it also signifies the return of the sun--or as in many a mythical tale--the rebirth of the light. 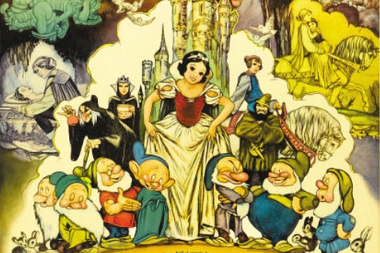 Walt Disney's animated masterpiece Snow White and the Seven Dwarfs premiered at the Carthay Circle Theatre in Los Angeles 72 years ago today...December 21, 1937.
with influences from animator Grim Natwick.